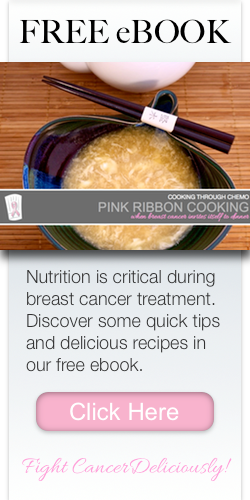 Pink Ribbon Cooking™ is founded on the premise that the food we take in has an impact on our lives, with or without cancer's presence at the table. For those living with cancer, or those at greater risk for certain types of cancer, diet can be one of the only variables that you are directly in control over. Pink Ribbon Cooking™ recognizes this and is designed to give you the tools to have relevant and essential recipes, techniques and, more than anything else, knowledge about the cooking process. Knowledge is power and power can be the catalyst for change. As with nutrition, one size does not fit all. However, each of has the ability to create a list of guiding principles that we can refer to as we make our food choices and diet plans. Below is a list of the principles that guide Pink Ribbon Cooking™ and inform us of why we cook, why we share the table and why it matters. Please feel free to openly adopt this list or to create your own and share it with us, or the world.